The Winter Solstice in mid December marked the low point of the year, with the shortest day and longest night. The sun had reached the lowest point in the sky and seemed to stand still for several days, before starting the long climb back up to the mid summer zenith. Put another way, the sun was reborn. While there may not seem to be much of a change initially, by mid January the days are noticeably longer and mornings lighter. The birds start to sing in the morning and the first spring flowers appear. The golden aconites, glinting in the low sun, and snowdrops in drifts in gardens and along road verges. The Spring Equinox in mid March marks the day when the battle against the darkness has been won, with the days and nights being of equal length. While the changing of the clocks at the end of March may seem to stall this process for a while – with the mornings becoming darker again for a couple of weeks – by the end of April everything is back on track. The Summer Solstice in mid June marks the longest day and shortest night. While it may seem far too early for the nights to start drawing in, they do, although it’s hardly noticeable until the middle of August. The middle of September marks the Autumn Equinox, when the days and night are back in balance. Then it’s the slow slide down to the long dark nights and the Winter Solstice. With these key points in the year, it’s not surprising that the Solstices and Equinoxes have been celebrated for thousands of years. Marking the changes in the year. Of birth, growth, harvest and decay / gestation in preparation for the new year. And this is still the case today in many parts of the world, as well as here in the UK, by those following a more natural way of life. Traditionally, the Winter Solstice marked the start of the new solar year – the sun year – hence the modern new year being on 1st January. It also explains the celebrations around Christmas and New Year. The farming year ran a little differently, with four Fire Festivals marking key points in the farming year. These fell midway between the Equinoxes and Solstices in early February, the end of April, early August and the end of October. The latter is still very familiar to us today as Halloween. The first festival in early February, known as Imbolc, marked the start of lambing and the first ploughing of the year. It celebrated the lengthening days, as the light returned. Thanks were also given to the home, particularly the hearth and fire, that had been so important during the long cold days of mid winter. 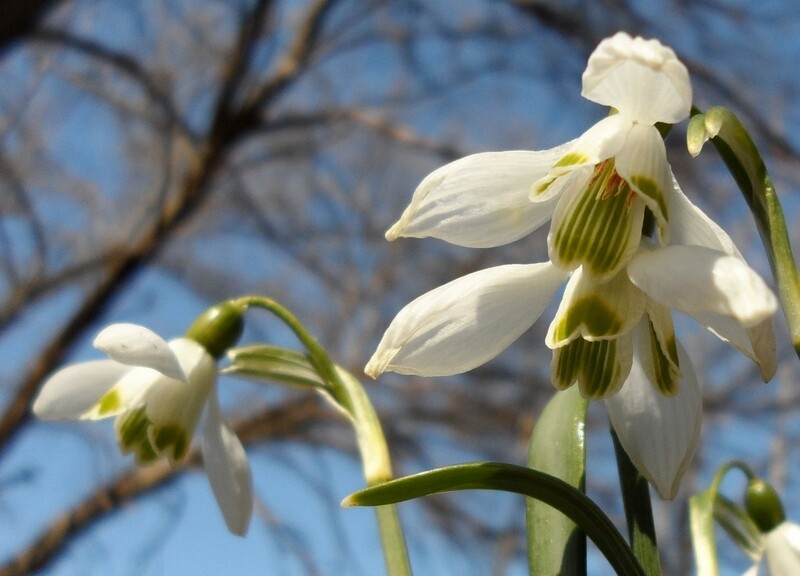 A flower was associated with Imbolc, the snowdrop, and its appearance is still eagerly awaited today. This was followed at the end of April by Beltane, when the cattle went out to the summer pastures and the last of the crops was sown. Another flower was associated with Beltane, the frothy hawthorn blossom which appears in the hedges in late spring. The start of August brought Lughlassadh – and “no” we can’t pronounce it either (!) – marking the start of the grain harvest and the baking of the first loaves of bread from that year’s wheat. Not surprisingly, ripe wheat marked this festival, a sign of plenty to come. And finally came the end of October and Samhain, better known these days as Halloween. This was the time for preparing for winter, bringing in the last of the root crops and culling any animals that were needed for meat during the long winter. The last of the falling leaves signalled the end of another farming year, as the earth seemed to fall into a long slumber in preparation for the new farming year. Together these two calendars give the year some structure, keeping us in tune with the world in which we live. And taking us away for a short while from the whims of the Gregorian calendar that now rules our world. In this high tech world of ours with all the modern conveniences, it’s all too easy to forget how reliant we are on this beautiful planet of ours. How life is much more precarious and fragile than we would like to believe. So why not take a little time to remember – and, perhaps, even celebrate or thank – this beautiful planet on which we live. Perhaps going for a walk or spending some time outside away from the hurly burly of modern life. You’ll feel much better for it and, with a festival, solstice or equinox occurring roughly every six weeks there’s never long to wait!